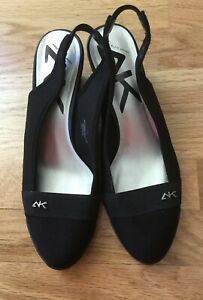 AK Anne Klein Sport Black Fabric and Patent Wedge. SZ. 5.5 M. EUC! Pretty! sueperki55 has no other items for sale. Details about AK ANNE KLEIN SPORT HEEL. BLACK. SZ. 7.5 M. EUC! Pretty! AK ANNE KLEIN SPORT HEEL. BLACK. SZ. 7.5 M. EUC! Pretty!